SG-1 helps to evacuate the Tok'ra to a new base -- but matters are complicated when a spy reveals their location to Apophis. The team attempts a daring plan to take out the Goa'uld's powerful fleet. On the Tok’ra homeworld of Vorash, Tanith is surprised to learn that a Goa’uld mothership has been spotted entering orbit — and that the Tok’ra have been expecting it. Jacob Carter transports into the hidden underground caves of the Goa’uld resistance movement, accompanied by the mothership’s owners: Colonel Jack O’Neill, Major Samantha Carter, Dr. Daniel Jackson and Teal’c. Actually, the ship is owned by Earth and Stargate Command. General Hammond has agreed to loan it to the Tok’ra (after recovering it from Cronus following the System Lord’s recent death [“Double Jeopardy”]), in exchange for instructions on how to operate it. The Tok’ra will use it to transport all of their people and the Vorash Stargate to a new world — a planet off the Goa’uld map of gates, so that they can finally establish a secure, long-term base of operations. Tanith, therefore, will not be going with them. He is a Goa’uld spy in the service of Apophis, whom the Tok’ra have been using for months to funnel disinformation to the Goa’uld (“Crossroads”). Tanith is put into a holding cell, and Teal’c soon visits him with news of his sentence. His Goa’uld symbiote is to be extracted and left behind on Vorash to die; hopefully, his host Hebron will survive. The spy has few options, and taunts the Jaffa about the murder of Teal’c’s lover, Shau’nac (“Crossroads”). Tanith won’t go quietly, though: he fakes a suicide attempt and overpowers his guards. He escapes to the surface, where he has hidden a Goa’uld communications device. Teal’c searches the surrounding desert for hours, but cannot find the traitor. Tanith has signaled Apophis, who will arrive with an attack fleet in less than a day — forcing SG-1 and the Tok’ra to adopt a new plan. The inhabitants of Vorash will be evacuated through the Stargate. 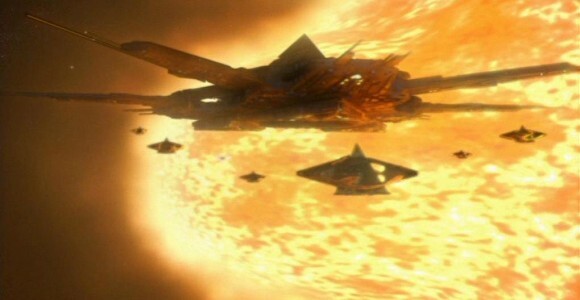 Jacob and the team will then use the Goa’uld mothership to send the gate — connected to a Stargate near the event horizon of a black hole (“A Matter of Time”) — into the sun. The black hole on the other side will pull through matter from the star, causing it to become unstable and triggering an artificial supernova. The entire Vorash system will be incinerated within minutes — and hopefully, Apophis’ massive fleet along with it. Teal’c derides himself for having let Tanith slip through his grasp a second time. He believes he should have avenged Shau’nac’s murder when he had the chance. But it is too late for Tanith, who is sure to be incinerated along with the planet. The plan seems to work — the Tok’ra are evacuated, and Carter is able to dial the gate to the black hole planet and enclose it in an energy shield. It is sent hurtling toward the sun, leaving a little less than an hour for Apophis to arrive and be caught in their trap. But Apophis isn’t the first to show. An Al’kesh, a Goa’uld mid-range bomber, appears and attacks SG-1’s mothership, knocking out main power and the hyperdrive. Sam and Jacob rush to fix it, while Teal’c and Jack pursue the ship in a death glider. They shoot it down on approach to Vorash, but their ship is damaged and they also crash-land. Apophis’ fleet arrives and takes up orbit around Vorash, and two Jaffa soldiers transport to the surface to pick up Tanith. But first, he leads them to Jack and Teal’c — and Teal’c is shot through the chest with a staff blast. O’Neill barely escapes, and watches as Tanith transports to Apophis’ ship with Teal’c. O’Neill returns to his own ship and reports that he believes Teal’c to be dead. He learns that the hyperdrive has been restored. The sun explodes, and the planet Vorash is incinerated. Jacob and SG-1 engage the hyperdrive and barely escape the shockwave. Apophis’ fleet is caught unaware, and destroyed. But the shockwave catches the tail end of the team’s ship, sending them far off course in hyperspace. They find themselves in a distant galaxy, 4 million light years and 125 years’ travel away from Earth. SG-1 is stranded. Not only that, but an all-too-familiar enemy arrives beside them. Apophis’ mothership escaped the blast and suffered the same fate as SG-1. The enemy ships have been marooned together. The Tok’ra do not possess a ship large enough to transport all their people, plus a Stargate. They required the use of Earth’s new Goa’uld mothership to move the base to a world outside the network of gates known by the Goa’uld, in order to create a more secure, permanent base. The Tok’ra have been moving their base of operations every few months or years to stay hidden from the Goa’uld — apparently since the founding of the movement 2,000 years ago. This attests to the relative ease with which a gate can be moved to a new world and still used. Presumably, the Tok’ra would have had to recalculate the Stargate’s address and point of origin symbol on a new planet, since the address system is keyed to the gate’s location in the galaxy. The Goa’uld have moved Stargates before. They apparently brought a second gate to Earth after the first was lost (“Solitudes”). Though SG-1 strongly objected to the Tok’ra keeping Tanith around to spread disinformation to the Goa’uld, their gamble has paid off. Because of Tanith, Tok’ra operatives have moved freely through Goa’uld territory. Stranded agents and allies were rescued, and hundreds of lives were saved. Earth has a large crew of engineers waiting to go over the Goa’uld mothership taken from Cronus after his death (“Double Jeopardy”). But Jacob has warned Jack about how dangerous the ship is, reminding him of the disaster that resulted when Earth tried to retrofit a Goa’uld death glider (“Tangent”). Jacob advised him to leave it with the Tok’ra. The Tok’ra methods for fighting the Goa’uld are certainly much different than those of Earth. Each time the Tau’ri have killed a powerful Goa’uld, a more warlike Goa’uld steps in to fill his place. There is more chaos in the galaxy than ever before, according to Jacob. And with the power that Apophis now possesses — after having taken control of the fleets of Sokar (“The Devil You Know”) and Heru’ur (“The Serpent’s Venom”) — the Tok’ra are on the brink of never being able to defeat the Goa’uld. In just four years, SG-1 has played a part in the deaths of Hathor, Seth, Sokar, Heru’ur, and Cronus. While that may seem good, Jacob makes a good point: the vacuum of power has been filled by Apophis, who now stands poised to rule the galaxy. Before, the feudal nature of the System Lords’ relationships kept the Goa’uld in check — a fact relied on by both the Tok’ra and the Asgard. The Tok’ra plan is more long-term: to undermine the Goa’uld’s power and keep them fighting amongst themselves, until the Tok’ra can find a way of completely defeating them. This is how the Tok’ra have been operating for two millenia; whether or not their method is so far successful is a matter of some debate. It should be noted, though, that the Tok’ra were present at the deaths of at least four powerful Goa’uld — and directly responsible for the deaths of at least three. A Tok’ra operative assisted SG-1 in escaping Hathor (“Into the Fire”). Jacob joined the team in tracking down and killing Seth (“Seth”). Aldwin joined Teal’c on a mission to kill Sokar, following orders directly from the Tok’ra High Council (“The Devil You Know”). And Jacob also led the Tok’ra-ordered mission to try and start a war between Apophis and Heru’ur — which regrettably led to the death of Heru’ur (“The Serpent’s Venom”). Sometimes, the Tok’ra’s methodology is quite direct. In fact, the Tok’ra’s destruction of Ne’tu — which killed Sokar — provided for Apophis’ re-ascension to power. And it was the Tok’ra failed plan to start a war between Apophis and Heru’ur that led to Apophis’ acquisition of the largest Goa’uld fleet ever. Perhaps the Tok’ra should not be so quick to blame Earth for the current state of the galaxy. P3W-451 — the black hole planet previously encountered by the team, where another S.G. unit lost their lives (“A Matter of Time”) — still contains an active Stargate. Though the planet may have been broken up in the year and a half since SG-1 escaped the singularity, the time dilation caused by the black hole’s intense gravity means that it could take years for that matter — including the Stargate — to spiral into the event horizon. Carter, somewhat astonishingly, has the Stargate address for P3W-451 memorized. After escaping, Tanith signaled a ship he had waiting in a nearby system — presumably belonging to Apophis. How long had the ship been there? Perhaps it was stationed there specifically for his use in case of an emergency. Jack is hit with a zat blast by Apophis’ Jaffa, but remains conscious. This is quite a feat of strength and of will, since a single shot is designed to render the victim unconscious. Jack did this once before, but with the help of smelling salts (“Prodigy”). (The Jaffa Fro’tak also remained conscious after being zatted once [“Family”]). Just where on the body the zat blast strikes may have something to do with it, as the shock seems to primarily effect the nervous system. The team’s plan was a success, and a large portion of Apophis’ fleet — no less than twelve Ha’tak-class motherships — were destroyed. Apophis’ own giant mothership escaped, though. The destruction of these ships may have successfully cut Apophis’ fleet down to size, so that he no longer has the ability to single-handedly defeat the System Lords. Apophis once suffered from the inevitable collapse of his power base after his original army lost only two motherships in Earth’s orbit (“The Serpent’s Lair”, “Family”). A Goa’uld mid-range bomber is called an “Al’kesh.” It is fast and extremely maneuverable, and is capable of cloaking. Teal’c – Teal’c was driven by his desire to avenge the murder of Shau’nac. Tanith’s escape consumed him, so that he regretted not killing the Goa’uld on the spot on either occasion where he had the opportunity (immediately after Shau’nac’s murder, and again in Tanith’s cell). When it became apparent that Tanith would escape Vorash, Teal’c risked everything — including the lives of his friends — to pursue him. He finally paid with his own life, apparently: Teal’c has been captured by Tanith and presented to Apophis, whom he betrayed, as a gift. Tanith – Exposed by the Tok’ra as a spy and condemned to extraction and death, Tanith escaped his captors and joined Apophis. In the mean time, he confessed to the murder of Shau’nac, and helped Apophis to capture (and probably kill) Teal’c. Tanith is apparently now trapped in a distant galaxy, along with SG-1, Jacob Carter, and Apophis’ mothership. Jack O’Neill – Excited about having his own Goa’uld mothership, Jack rebuffed Jacob’s attempts to convince him that Earth doesn’t have any business fooling around with Goa’uld technology. Jack also continued to proudly defend Earth’s accomplishments in fighting the Goa’uld — killing powerful leaders like Hathor, Cronus, and Seth. Jack also struggled with Teal’c’s unwavering pursuit of Tanith, in order to avenge the death of Shau’nac. O’Neill knew that Teal’c’s actions were unwise, and made his opinions clear — but still trusted his friend, and did not order Teal’c to give up pursuit. It’s something that Jack will certainly come to regret, since it seems to have led to Teal’c’s death, even as he stood beside Colonel O’Neill. Apophis – Before using his massive army to attack the System Lords, Apophis apparently felt it more worth-while to attack the Tok’ra resistance movement in an attempt to wipe them out. But in trying to do so, Apophis lost no fewer than 12 Ha’tak-class motherships — and was himself shot 4 million light years away from home. He is stranded in another galaxy with SG-1, but he has captured the traitor Teal’c (thanks to help from his servant, Tanith). Jacob Carter – Jacob expressed great concern over Earth’s possession of such a powerful, complicated and dangerous thing as a Goa’uld mothership. He continues to support the Tok’ra’s efforts and philosophy, risking his life to try and take out part of Apophis’ fleet. He has great confidence in his daughter’s abilities, and in the skills of the rest of her team. Like the others, Jacob has found himself stranded in another galaxy, 125 years’ travel away from home. How will Apophis react to the fact that the Tok’ra have been using Tanith against him? How did Tanith overpower his cautious, well-armed guards and escape? From where did Tanith acquire a Goa’uld communications device? How did he come into Apophis’ service, since he infiltrated the Tok’ra immediately after coming to maturity? To what planet did the rest of the Tok’ra go? Will they try again to move that Stargate to a new planet, provided the team returns with the mothership? Will the destruction of the Vorash star and system have any unforeseen consequences? How large is Apophis’ fleet now? Will he still attack the System Lords? Is there a Tok’ra operative still working on Apophis’ mothership (“The Serpent’s Venom”)? Is Teal’c dead? Will Apophis revive him with a sarcophagus? In what galaxy is the team stranded? The Asgard’s? The Ancients’? How will they get home? VOTE! How would you rate SG-1's "Exodus?"